In the rapidly growing CBD industry, it’s only a matter of time when the market will become overloaded with companies selling Cannabidiol-infused goods. That being said, those who want to coin a reputation of a trustworthy CBD supplier must comply with some standards that could separate them from mediocre-to-low quality sellers. Looking for a new brand of CBD oil to try? We have found one that you might be interested in, especially that it supports an all-natural approach to their CBD extraction techniques and the source of their cannabidiol. Chances are that you might have heard about Lazarus Naturals. The company’s mission is clear: Lazarus Naturals wants to do it better than competitors, but above all, it wants to fill the gap in the market where many businesses offer low-quality and sometimes unsafe CBD products to unaware customers. Lazarus is a US-based CBD supplier that is focused on incorporating organic, all-natural techniques into their CBD oil manufacturing practices, which definitely has paid them off given incredibly positive reviews from satisfied customers. When Dope Magazine visited Lazarus Natural’s production facility, the guys were impressed with the standard of equipment, especially with the rotary evaporator. All their products are subject to third-party lab testing which check for the presence of pesticides, heavy metals, and microbial levels; the results are available on the company’s product pages. Like we said, there are certain standards a CBD supplier has to meet in order to join other reputable companies. Fortunately, Lazarus Naturals meets all these criteria. Their extracts are blended with a number of organic plant-derived oils to ensure effective dosing. Now, it’s high time we reviewed the Lazarus Naturals’ range. Despite having only spent one year in the CBD isolation market, Lazarus Naturals have coined the reputation of a trustworthy CBD supplier. 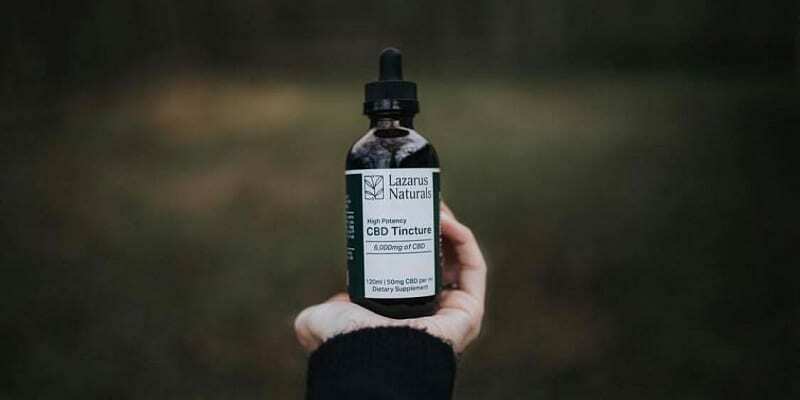 The company sells three major categories of products: there are Lazarus Naturals Tinctures (both regular and high potency), CBD capsules, isolates, and even CBD RSO (more on that later). We are here to shed some light on the whole range and decide whether or Lazarus Naturals deserves kudos. One milliliter of these tinctures is an equivalent to 30 drops, so there’s 0.5mg of CBD in every drop. The bottle comes with graduated droppers that make it easy to measure doses and administer the CBD oil accurately. As you can see, Lazarus Naturals CBD oil tinctures are among the cheapest products available from a reputable provider. Simply take the dropper, put a few drops beneath your tongue and hold for several seconds before swallowing. We found that the oil worked very fast, significantly reducing the stress and anxiety. The feeling of clear-headedness and the soothing bodily sensation needed about 30 minutes to kick in, which is a standard period you need to wait in order to feel the effects. As for their duration, the effects lasted up to 5 hours. One time, one of our team members tried a strong dose before sleeping, claiming that he’s never felt so rested before. Here it comes, the company’s second-most popular product, Terpene-Infused CBD Isolate. It is available in four different flavors, namely Raw, Valencia Orange, Citrus, and Lemon Lime. Like all products from Lazarus Naturals, this isolate is sourced from the Colorado-grown hemp, and the terpenes are isolated from natural plants. You can also purchase the CBD Isolate in bulk: 20 grams cost $450, 50 grams cost $1,000, and the company allows you to purchase up to 1,000 grams! All you have to do is get in touch with Lazarus Naturals and place an order. As it is 99% CBD isolate, it is not a whole plant extract, so consuming the raw isolate doesn’t belong to the most pleasurable experiences. Nonetheless, you can dissolve the extract in one of ‘carrier’ oils. Keep in mind that it is not water soluble, though. Alternatively, you can vape the isolate in a portable vaping device. We tried vaping the isolate and we must admit that it does it jobs pretty well. Although it doesn’t carry the additional benefits of whole-plant extracts, it takes what’s best from Cannabidiol. The isolate is terrific for vaping or dabbing, but you can also rub it on the affected area to tackle pain in a specific spot. Regardless of your previous experience in CBD, you can adjust the dosage according to your needs. If you have previously been on a lower dose of Cannabidiol and need a little more, the 25mg version will be a great option. In addition, the capsules are supplemented with organic terpenes to get the most out of the hemp used, which contributes to the overall quality of this product. Just like any other capsules, just take one and swallow it, drinking the capsule down with water. Like we said, we tried the 25mg version, because the majority of our team takes CBD in small doses on a day-to-day basis. Given this, that was the easiest way to check their efficacy. We must say that they work great for mild-to-moderate anxiety. Other users who tried the Lazarus Naturals Capsules stated that the 100 and 200mg versions are perfect for chronic pain. While we haven’t had the chance to test every item from the Lazarus Naturals’ range, we were excited to learn that the company sells CBD RSO. It is a CBD extract that comes from the domestically sourced hemp and extracted with the use of kosher ethanol. It’s perfect if you want to add some CBD to your meals: imagine starting the day with a healthy dose of CBD RSO in your shakshuka? It comes at $40 for 1,000mg of CBD or $180 for 5,000mg. Finally, there’s the CBD-infused coconut oil. It contains a massive 50mg of CBD per teaspoon, which makes the oil one of the most versatile products on the market. You can use it for cooking, making CBD-infused lotions and cosmetics, or sweet edibles. A one-ounce tube costs $15 and gives a user six servings while the larger four-ounce tube costs $50 and contains 24 servings. Like most companies in the niche, Lazarus Naturals sells its products through their Shop page on the official website. Lazarus also uses USPS shipping, so you can expect your order to be shipped within 1-3 business days. You can return any product within the 14-day period if you’re not satisfied, but customers must cover the shipping cost. At the time of writing, few CBD retailers offer a better $ per mg ration than Lazarus Naturals. Although the company was only formed in 2016 – being a 2-year-young business now – it has already gained a celestial reputation in the industry. Their customer service is always here to help you, either through a ‘Contact Us’ form or via Facebook. When it comes to the efficacy of the company’s range of CBD-infused goods, one simply cannot question it. The tinctures and isolate have extremely fast acting time, with the effects being noticeable in under 10 minutes according to some users. If you’re keen on testing different CBD products, the company has got you covered, too, with their range of capsules, CBD RSO, and the CBD-infused coconut oil. In our opinion, Lazarus Naturals is hands down a trustworthy manufacturer!